Should you or shouldn't you buy it. 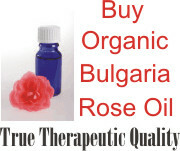 Due to the high price of rose essential oils, many people are not willing buy them. But even with their prohibitive price, rose oils are still perhaps the most widely used oils in aromatherapy and the most sought after essential oils. What makes the price of rose essential oils so expensive? Imagine that to produce 1 pound of rose essential oils, you will need 5000 pounds of fresh rose petal. And to harvest, you need to do that before sunrise, otherwise their oil content will diminish later in the day. All the petals are extracted by steam distillation. And that is why their scent is so potent. Just 1 or 2 drops in aroma lamp will change the whole room's atmosphere. Did you know that it takes 60,000 fresh roses (200 pounds) to make one ounce of rose essential oil? That equals 30 roses for every single drop! It's no wonder that rose essential oil is so expensive. Many suppliers mix it with rose geranium oil to cut a bit on the cost. This essential oil is priced due to its notable characteristic in scent that lasts for a long period of time that is very delightful! Here are a couple things to consider if you want to buy Aromatherapy rose oils. You don't mind swapping it with other essential oils. Some of essential oils have the same effect on our body though they do not have same scent. As such rose is uses as an aphrodisiac but besides rose you can also use ylang ylang essential oils, which I think are cheaper than rose. You don't know how to tell between a real one with the fake one. There are many fake rose essential oils out there, and also there are many rose essential oils which produced from cheaper plants. Therefore you should beware when purchasing rose essential oils. You don't mind to use rose hydrosol as a substitute for rose essential oils. These plants of rose are cultivated in Bulgaria, Tunisia, Morocco, Turkey, southern France, Italy, India, China, and the Soviet Union. But the oil which is produce in Bulgaria is far superior, while the oil produced in Turkey is too heavy and passionate for most people.